In 1994, Marina Langer discovered a tumor on her spinal cord between her shoulder blades. She had surgery to remove the tumor but the operation impacted the sensation and movement in her lower extremities. She found that while she could use her right leg, it didn’t have sensation. She could barely use her left leg, if at all. At first, Marina could manage to walk feebly with a cane. She found it difficult, if not dangerous and impossible, however, to drive a car and certainly couldn’t manage on a highway. Time and time again, she was forced to seek the help of her friends and neighbors, asking them to drive her where she needed to go. Marina feared she was a burden to others and longed to have the mobility she enjoyed before the surgery. 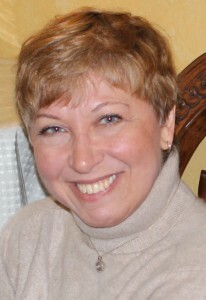 Marina, who moved to the United States from Ukraine when she was 19 years old, is now very much at home in Duxbury, MA. While her two children have grown-up and live on their own, she enjoys the company of her dogs. She has made a few adjustments to her one-level house and has learned to be remarkably independent. While she now can walk only with a walker and uses a wheelchair to travel long distances, she goes to yoga three times a week and has a regular gym routine to help strengthen her muscles. She marveled with amusement how “buff” her arms have become as a result of her wheelchair and walker use! In December 2014, Marina received a grant of $2,250 from the Travis Roy Foundation to modify her SUV so that she can operate a car again. With the installation of hand controls, Marina can easily steer, break, and accelerate. She only needed two lessons before confidently getting on the road in her refurbished vehicle. Marina is so grateful to the Travis Roy Foundation to have use of her car, which means so much to her independence. She described the grant process as “an incredibly positive experience,” and is thankful that the TRF is there to provide critical financial assistance to her, and so many others with spinal cord injuries.